Using the School Admin menu, administrators may register users, edit their accounts, or monitor usage. School Loop Standard sites do not include student and parent accounts, so those menu choices are not available. If the optional Directory Services integration is in use, there is an additional menu choice for activating user accounts. This information will be used by Principals, Assistant Principals, and System Admins. All three of these roles have sufficient permissions to manage the user accounts for that site. In order to do this, Click User Management to reveal a horizontal menu bar near the top of the page. Administrators also have rights to edit school settings. For Standard sites, there are only two settings: Hide or show the email icon in the staff directory of the school website, and an import ID utility to be used when upgrading to School Loop Plus. Administrators of School Loop Plus have settings that include access rights and registration management. Customizable groups of students that allow administrators and teacher to focus on their needs. 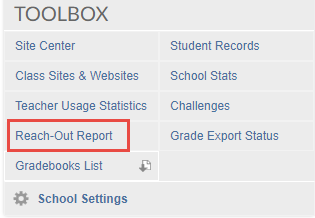 The Reach-Out Report option prints students' homepages and provides a weekly summary of the grades and assignments due. These reports can be generated by an administrator for each student who does not have a registered parent or for all students at the school. The report for all students is alphabetically printed and the report for students without a registered parent is printed in sets by first period teachers for easy distribution.